The Product Development Director takes charge of leading the company by researching new products or product enhancement or product redesigning. The job description template of these directors mentions some highlighting tasks such as – originating new product based on customer needs, selecting appropriate design concepts for the product, evaluating the potentiality or practicality of the product, planning and formulating all aspects of R&D proposals, negotiating contracts and implementing methods for monitoring projects. 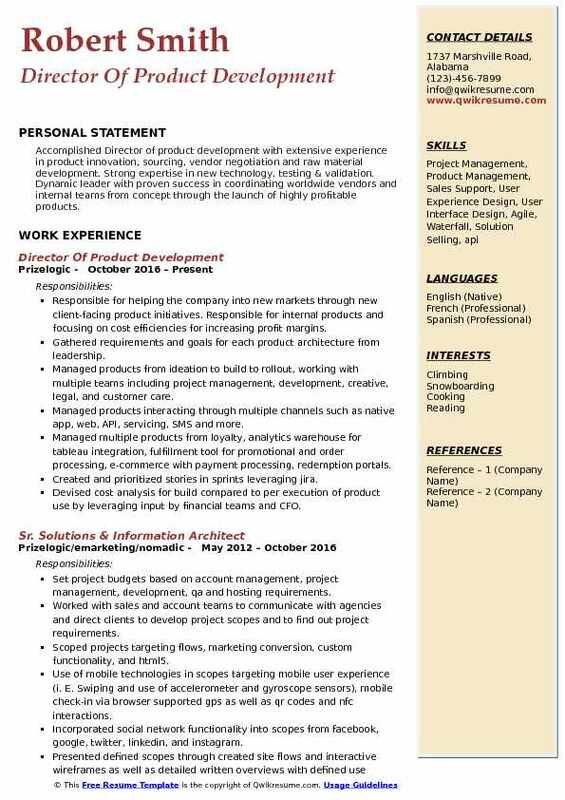 The requirements normally considered essential for this job role are product development expertise, a strong understanding of related products and methods, demonstrable ability to improve existing processes and repeated process in and out of product-development, project managing skills, and apt troubleshooting skills. 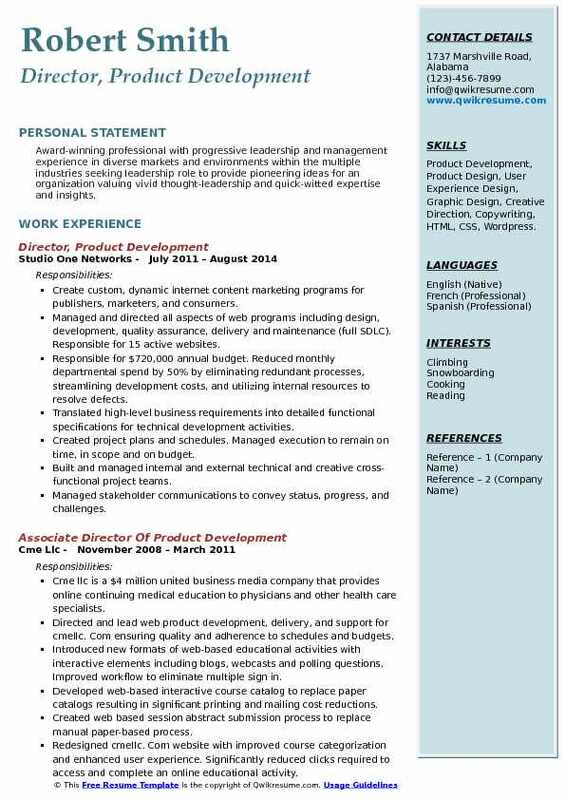 Director of Product Development Resume normally mentions a degree in the field of business or engineering. Summary : Energetic and accomplished leader with over 15 years of product management including product development, brand building, sourcing, product engineering, and Production. 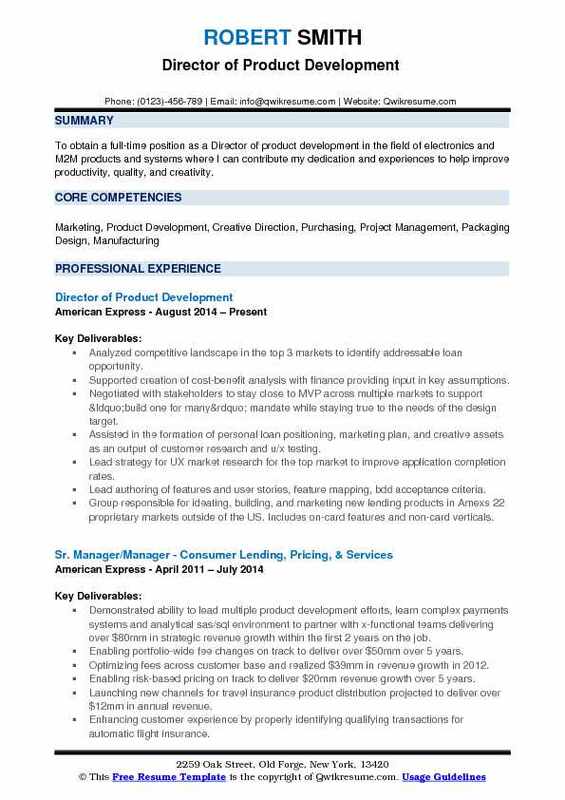 Skills : Skills include line building, trend scouting, innovative material sourcing and developing key vendor relationships. General manager for the cloud-hosted time and attendance software product with 1000+ customers. Managed 20 people cross-functional team comprising of development, support, professional services, sales, it and billing personnel. Initiated rebranding of the product, by hiring a marketing firm to redo the product name, logo, marketing website, new and existing customer drip campaign that was in line with desired product positioning. Initiated development of internal facing analytics application that aggregates customer profile, feature usage and financial data from billing, IT, customer databases, CRM, help desk systems. Responsible for managing $2 million budget, profitability, expense tracking, identifying profitable revenue streams, Orchestrated a strategic, technical and business turnaround of a stagnant legacy product by inspiring senior management towards a new turn-key saas vision. Launched a new enhanced version of the product, with improved usability, and value-added features within 1.5 years. Achieved self-signup, self-cancellation, auto-upgrades, free trials, automated billing for a true saas user experience. Introduced new usage-based freemium pricing model as opposed to tiered pricing, making product up to par with the market - resulting in a projected revenue increase of 3 to 5 folds. 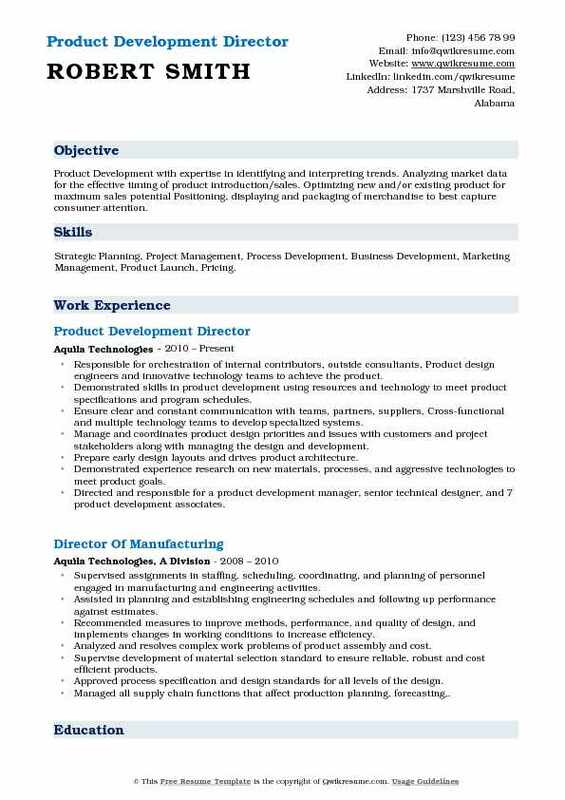 Summary : To obtain a full-time position as a Director of product development in the field of electronics and M2M products and systems where I can contribute my dedication and experiences to help improve productivity, quality, and creativity. Analyzed competitive landscape in the top 3 markets to identify addressable loan opportunity. Supported creation of cost-benefit analysis with finance providing input in key assumptions. Negotiated with stakeholders to stay close to MVP across multiple markets to support “build one for many” mandate while staying true to the needs of the design target. Assisted in the formation of personal loan positioning, marketing plan, and creative assets as an output of customer research and u/x testing. Lead strategy for UX market research for the top market to improve application completion rates. Lead authoring of features and user stories, feature mapping, bdd acceptance criteria. Group: responsible for ideating, building, and marketing new lending products in Amex's 22 proprietary markets outside of the US. Includes on-card features and non-card verticals. Responsible for expanding the service of borrowing as a top priority for the U card business. Includes new initiatives such as installment and personal debt consolidation as well as traditional credit card lending. Summary : Seeking a full time position bringing 20 years of successful product development and management expertise to a company in need of developing a branded product assortment. 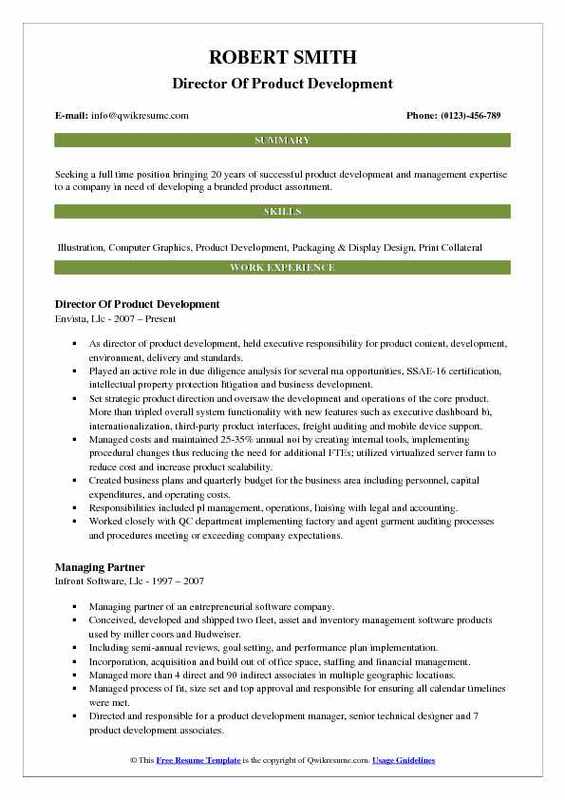 As director of product development, held executive responsibility for product content, development, environment, delivery and standards. Played an active role in due diligence analysis for several ma opportunities, SSAE-16 certification, intellectual property protection litigation and business development. Set strategic product direction and oversaw the development and operations of the core product. More than tripled overall system functionality with new features such as executive dashboard bi, internationalization, third-party product interfaces, freight auditing and mobile device support. Managed costs and maintained 25-35% annual noi by creating internal tools, implementing procedural changes thus reducing the need for additional FTE's; utilized virtualized server farm to reduce cost and increase product scalability. Created business plans and quarterly budget for the business area including personnel, capital expenditures, and operating costs. Responsibilities included pl management, operations, liaising with legal and accounting. Worked closely with QC department implementing factory and agent garment auditing processes and procedures meeting or exceeding company expectations. 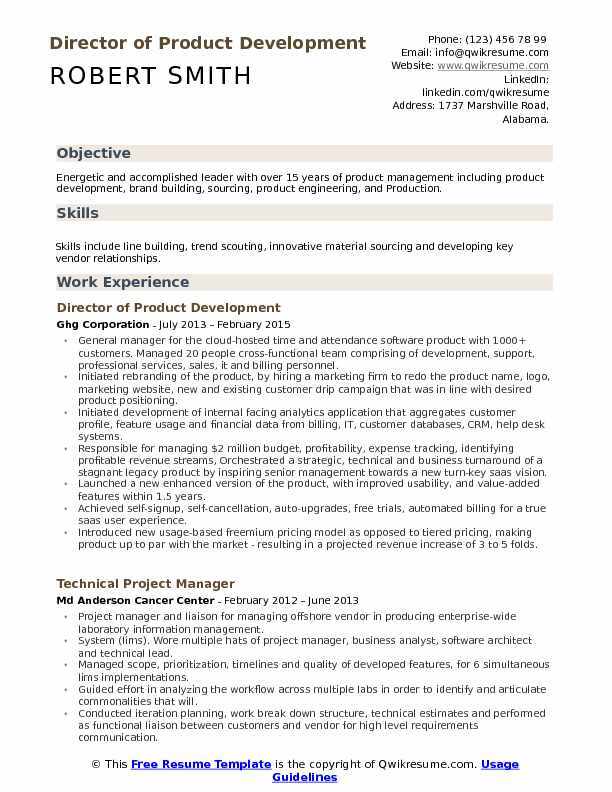 Summary : Business professional with product management/development experience. Demonstrated success in developing new products and increasing company profits. Excellent communication, collaboration, and organizational skills. Manage OEM and new IP projects from marketing briefs and concepts to production. Manage 4 persons in the US, and for 4 persons in China for operations, engineering and project management. Managed sculpting, modeling and project management for Activision Skylanders and toys to life product development. Managed timelines, costing and new idea development. Built new product development and brought new ideas for build play line of model kits that created a new category of products for 6+ age grade, which included lights sound, durable plastic material, snap-tite features and easy to build. Manage model and sculpting process for work-like and looks like models. Conducted product research on existing miniature gardening lines for quality, cost, and found a gap in the market for the lawn and garden and specialty toy and gift market. Conducted kids testing with models and concept ideas. Designed and developed a full line of fairies, accessories and planter kits. Finalized sculpting, modeling, tooling and production planning. Developed the pricing strategy for distributer, wholesale, and retail pricing. Work closely with the brand approvals for each phase of development progress, concept, first sculpt, painted models, packaging and production approvals. Summary : Award-winning professional with progressive leadership and management experience in diverse markets and environments within the multiple industries seeking leadership role to provide pioneering ideas for an organization valuing vivid thought-leadership and quick-witted expertise and insights. Skills : Product Development, Product Design, User Experience Design, Graphic Design, Creative Direction, Copywriting, HTML, CSS, Wordpress. Create custom, dynamic internet content marketing programs for publishers, marketers, and consumers. Managed and directed all aspects of web programs including design, development, quality assurance, delivery and maintenance (full SDLC). Responsible for 15 active websites. Responsible for $720,000 annual budget. Reduced monthly departmental spend by 50% by eliminating redundant processes, streamlining development costs, and utilizing internal resources to resolve defects. Translated high-level business requirements into detailed functional specifications for technical development activities. Created project plans and schedules. Managed execution to remain on time, in scope and on budget. Built and managed internal and external technical and creative cross-functional project teams. Managed stakeholder communications to convey status, progress, and challenges. Drove quality assurance and delivery processes to manage and control risk. Experience with Drupal and custom home-grown content management systems. Summary : Product Development with expertise in identifying and interpreting trends. Analyzing market data for the effective timing of product introduction/sales. Optimizing new and/or existing product for maximum sales potential Positioning, displaying and packaging of merchandise to best capture consumer attention. Skills : Strategic Planning, Project Management, Process Development, Business Development, Marketing Management, Product Launch, Pricing. Responsible for orchestration of internal contributors, outside consultants, Product design engineers and innovative technology teams to achieve the product. Demonstrated skills in product development using resources and technology to meet product specifications and program schedules. Ensure clear and constant communication with teams, partners, suppliers, Cross-functional and multiple technology teams to develop specialized systems. Manage and coordinates product design priorities and issues with customers and project stakeholders along with managing the design and development. Prepare early design layouts and drives product architecture. Demonstrated experience research on new materials, processes, and aggressive technologies to meet product goals. Directed and responsible for a product development manager, senior technical designer, and 7 product development associates. 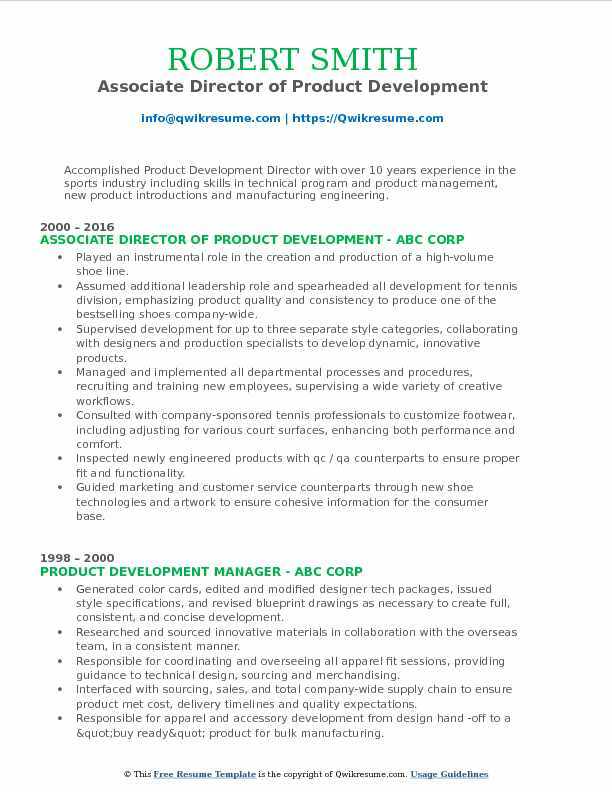 Summary : Accomplished Product Development Director with over 10 years experience in the sports industry including skills in technical program and product management, new product introductions and manufacturing engineering. Played an instrumental role in the creation and production of a high-volume shoe line. Assumed additional leadership role and spearheaded all development for tennis division, emphasizing product quality and consistency to produce one of the bestselling shoes company-wide. Supervised development for up to three separate style categories, collaborating with designers and production specialists to develop dynamic, innovative products. Managed and implemented all departmental processes and procedures, recruiting and training new employees, supervising a wide variety of creative workflows. Consulted with company-sponsored tennis professionals to customize footwear, including adjusting for various court surfaces, enhancing both performance and comfort. Inspected newly engineered products with qc / qa counterparts to ensure proper fit and functionality. Guided marketing and customer service counterparts through new shoe technologies and artwork to ensure cohesive information for the consumer base. 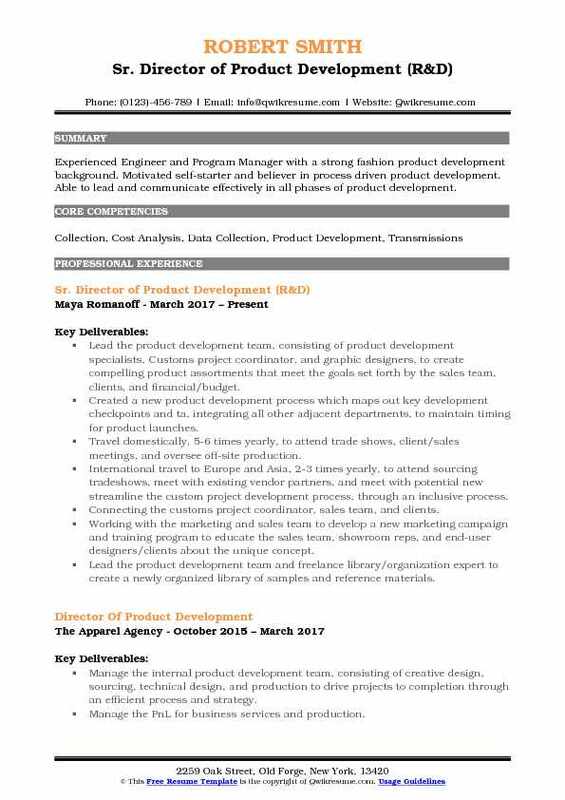 Summary : Experienced Engineer and Program Manager with a strong fashion product development background. Motivated self-starter and believer in process driven product development. Able to lead and communicate effectively in all phases of product development. Lead the product development team, consisting of product development specialists, Customs project coordinator, and graphic designers, to create compelling product assortments that meet the goals set forth by the sales team, clients, and financial/budget. Created a new product development process which maps out key development checkpoints and ta, integrating all other adjacent departments, to maintain timing for product launches. Travel domestically, 5-6 times yearly, to attend trade shows, client/sales meetings, and oversee off-site production. International travel to Europe and Asia, 2-3 times yearly, to attend sourcing tradeshows, meet with existing vendor partners, and meet with potential new streamline the custom project development process, through an inclusive process. Connecting the customs project coordinator, sales team, and clients. Working with the marketing and sales team to develop a new marketing campaign and training program to educate the sales team, showroom reps, and end-user designers/clients about the unique concept. Lead the product development team and freelance library/organization expert to create a newly organized library of samples and reference materials. 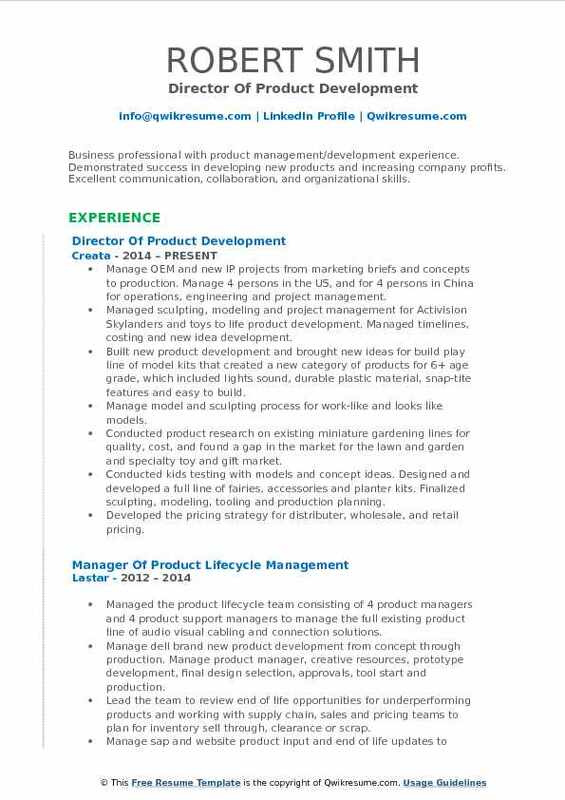 Summary : Accomplished Director of product development with extensive experience in product innovation, sourcing, vendor negotiation and raw material development. Strong expertise in new technology, testing & validation. Dynamic leader with proven success in coordinating worldwide vendors and internal teams from concept through the launch of highly profitable products. Responsible for helping the company into new markets through new client-facing product initiatives. Responsible for internal products and focusing on cost efficiencies for increasing profit margins. Gathered requirements and goals for each product architecture from leadership. Managed products from ideation to build to rollout, working with multiple teams including project management, development, creative, legal, and customer care. Managed products interacting through multiple channels such as native app, web, API, servicing, SMS and more. Managed multiple products from loyalty, analytics warehouse for tableau integration, fulfillment tool for promotional and order processing, e-commerce with payment processing, redemption portals. Created and prioritized stories in sprints leveraging jira. Devised cost analysis for build compared to per execution of product use by leveraging input by financial teams and CFO. Defined functionality through technical requirements documentation for development teams. Responsible for creation and presentation of product roadmap to upper management and board of directors. 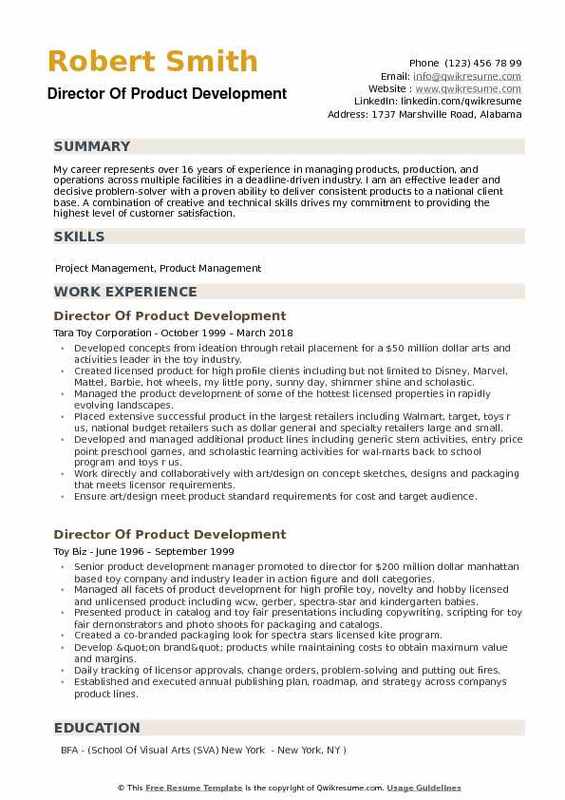 Summary : My career represents over 16 years of experience in managing products, production, and operations across multiple facilities in a deadline-driven industry. I am an effective leader and decisive problem-solver with a proven ability to deliver consistent products to a national client base. A combination of creative and technical skills drives my commitment to providing the highest level of customer satisfaction. Developed concepts from ideation through retail placement for a $50 million dollar arts and activities leader in the toy industry. Created licensed product for high profile clients including but not limited to Disney, Marvel, Mattel, Barbie, hot wheels, my little pony, sunny day, shimmer shine and scholastic. Managed the product development of some of the hottest licensed properties in rapidly evolving landscapes. Placed extensive successful product in the largest retailers including Walmart, target, toys r us, national budget retailers such as dollar general and specialty retailers large and small. Developed and managed additional product lines including generic stem activities, entry price point preschool games, and scholastic learning activities for wal-marts back to school program and toys r us. Work directly and collaboratively with art/design on concept sketches, designs and packaging that meets licensor requirements. Ensure art/design meet product standard requirements for cost and target audience. Work collaboratively with sales addressing retail buyer feedback, supplying key product information, marketing ideas and materials for effective sales presentations.